Shaak-posto with chingri (prawns), I don’t know if such a dish really exists, however I made it up today morning 🙂 and it tasted good so I thought of keeping the recipe safe. However, I only have the picture of the finished dish; so only the quick recap for this recipe. 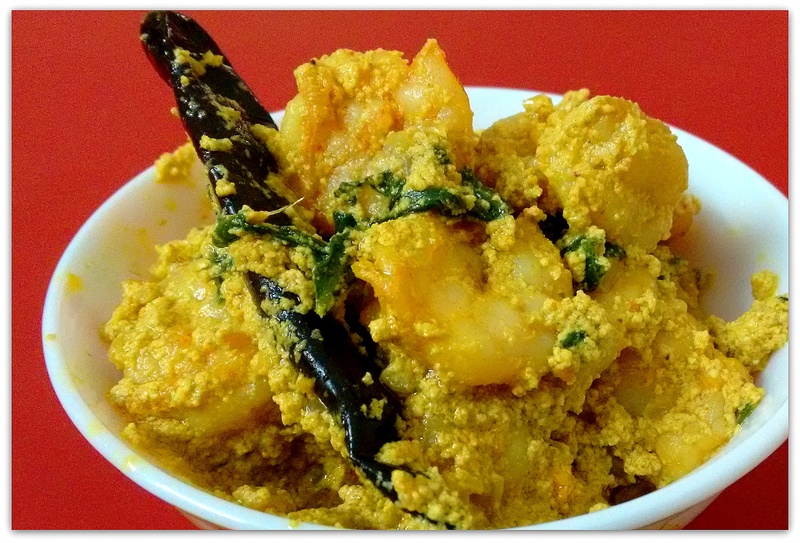 Marinate the prawn with the salt, turmeric and red chilli powder for half an hour. In a frying pan add mustered oil. Heat the oil till it starts to fume. Add the marinated prawns and fry half minute each side. Be careful, prawns tend to overcook fast. Take them off the heat. Keep them aside. You can reuse the oil if you want to, or get some clean oil as well. Whatever you do, in the oil now put the panch-foron (or whole cumin seeds) and the whole red chilli. lightly fry. Then add the Onion (cut into small pieces) in the oil, add the sugar and fry till they are translucent. Now add the posto paste in the pan with little more water. Add salt to taste and black pepper powder. Cover the the pan, lower the heat and cook till the posto is done. Now add the shaak cut into small pieces in the pan. Cook till it is done. See that most of the water has been evaporated. It is better to be a little dry then a gravy dish. Now it is time to add the prawns. Mix and take the pan out of heat.